If I worked at McDonald’s, I would put an extra nugget in everyone’s order of Chicken McNuggets. If I worked at Burger King, I would put two onion rings in every order of fries. Why? Because ‘bonus rings’ and ‘bonus fries’ are awesome. As are extra nuggets. 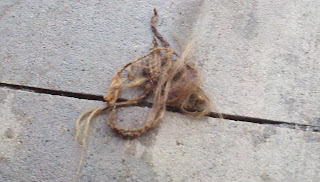 Also, have you or someone you love lost a hair weave? I found one lying next to the gas pump yesterday. If this looks familiar, if you’ve recently lost your hair weave, or know someone who recently lost theirs, please contact me. I’ll go back and see if it’s still there. Unless an employee thought it was a dead animal and picked it up so not to spread deadly diseases to the customers.